Jeremy Corbyn has had to fight continually to remain leader of the Labour Party since he was elected with an overwhelming mandate in 2015. The right-wing of the Parliamentary Labour Party (and that’s the vast majority of it, let’s face it) have tried to undermine his leadership from inception and on more than one occasion have aggressively tried to overthrow it. The enmity does not, however, go both ways. Corbyn’s leadership is pretty much the only thing he has determined to stand firm on – almost everything else has been up for grabs in sacrifice to party unity. And party unity means alliance with a collection of brutally anti-working class and mercilessly imperialist politicians. Yet, the majority of what is known as ‘the Left’ in Britain insists on supporting Labour and calling for others to do so. Excuses for supporting the Labour Party from many socialists often include the claim that they are ‘pushing Labour left’. But in practice it does nothing of the sort, rather, it sheepdogs otherwise progressive people into a thoroughly reactionary endeavour. In my experience the socialists who claim to support the Labour Party ‘the same way a rope supports a hanged man’ almost exclusively foster illusions in the bourgeois Labour Party, misrepresent it as progressive, and fail to point out when its actions contradict its rhetoric. They claim that a Labour government would more easily succumb to pressure than a Tory one. But pressure needs to take the form of actual opposition: criticism, protests, direct action and organisation of the working class, not uniform applause and devotion. Labour is not an innocent puppy that needs positive reinforcement, it’s a rabid attack dog of the ruling class. Entryism has been tried many times before, and it has never worked. It’s a cliché, but you don’t end up changing the organisation, it ends up changing you. You don’t have to look too far for historical examples of socialist hopes being dashed by opportunists: Mitterrand in early ‘80s France and more recently Syriza in Greece to name just two. Purveyors of the ‘push Labour left’ argument point to Corbyn’s successive electoral successes and the steady replacement of Blairites with Corbynites at local level and on the NEC. The last General Election brought in some of Corbyn’s acolytes to join his anti-austerity crusade, for example Laura Pidcock, who as a local councillor for Northumberland voted for £36M worth of cuts for 2017-20[i]. Such a stalwart opponent of austerity! If these are the supposedly progressive replacements, there really isn’t much to get excited about. Corbyn and McDonnell certainly have the most progressive record of any Labour MPs, but even that is not particularly socialist. Don’t just take my word for it; listen to Corbyn and McDonnell themselves. 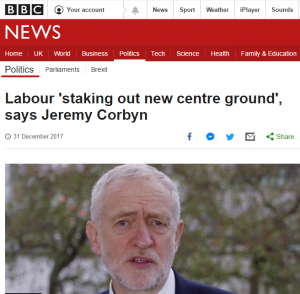 Corbyn said explicitly: ‘we’re staking out the centre ground’. Both have given speeches to the CBI (the Confederation of British Industry: just about the most organised collection of Britain’s capitalists in any one place) promising to deliver employees to work on time, healthy so they don’t have too many sick days and educated enough to perform their roles – all for the benefit of capitalist profits[ii]. 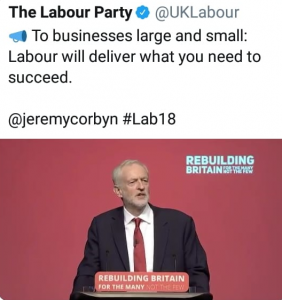 In his 2018 conference speech, Corbyn said ‘I say to businesses large and small: Labour will also deliver what you need to succeed and to expand and modernise our economy’[iii]. Labourites are very fond of the ‘No True Scotsman Fallacy’ when defending the image of Jeremy Corbyn. ‘That’s not real Labour, that’s New Labour. That’s not Jeremy’s fault, that’s the Blairites’ and so on and so on until we’re left only with Corbyn and McDonnell themselves. But the duo are not so quick to disown their party’s history, the opposite in fact, they are all-too-proud of it. 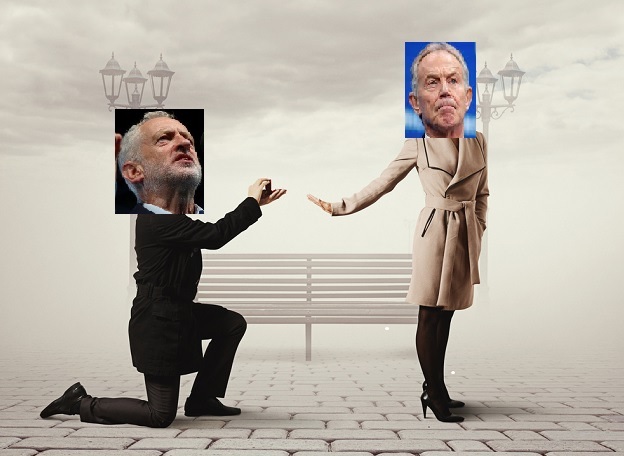 Many Corbynites claim to despise Blairites and New Labour, yet it’s obvious he doesn’t share their hatred – in fact, he spent over a decade working with them on a day-to-day basis and campaigned for Blair to be Prime Minister three times. Let’s be clear, many of them are war criminals. But JC not only rubs shoulders with them, he tries to give them jobs and wholeheartedly upholds the organisation they (and he) represent. He has bent over backwards to accommodate the right-wing of the party since becoming leader and he was also out on the streets campaigning for the avowedly neoliberal Sadiq Khan to become London’s mayor. To cement the point that Corbyn is interested more in reconciling with the Blairites than defeating them, Momentum (Corbyn’s faction in the party) have emphasised they will make no attempt at deselection. Moreover, many members have been ruthlessly kicked out for infractions (such as being socialist), while Blair’s membership remains safe. Corbyn himself once stated Blair should face charges at The Hague, but many of his parliamentary allies have consistently voted against investigations into the Iraq War (Diane Abbott was absent for 13 votes about investigating Iraq War, voted in favour once, and against once[iv]). 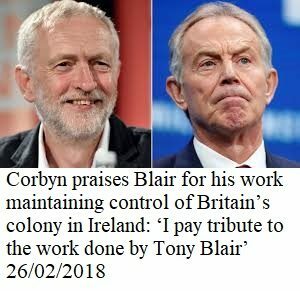 He has since gone mysteriously quiet on that issue and now praises Blair for his work maintaining control of Britain’s colony in Ireland (‘I pay tribute to the work done by Tony Blair’[v]). 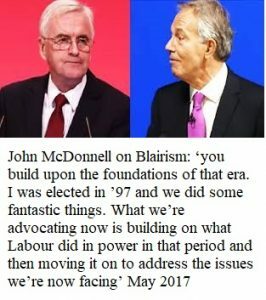 John McDonnell has been even more explicit about his admiration for the ‘Blairites’: ‘you build upon the foundations of that era. I was elected in ’97 and we did some fantastic things. What we’re advocating now is building on what Labour did in power in that period and then moving it on to address the issues we’re now facing’[vi]. Corbyn was quick to select prominent Blairites in his shadow cabinet and in May 2016 gave a keynote address to the annual Progress conference (Progress is the Blairite equivalent of Momentum). He told them ‘I want to see our party even bigger and even stronger, but above all united’[vii]. Party unity is Corbyn’s number one priority and the lives of Syrians and the living standards of the working class have been and will be sacrificed to this principle. Corbyn then emphasised his commitment to capitalism in response to an audience question: ‘there’s a huge private sector, there’s always going to be, and we’re going to have to work with that’[viii]. Much of Corbyn’s reputation rests on his supposed opposition to the Iraq War. (So anti-imperialist that even Tories Ken Clarke and Peter Hitchens were capable of holding the same position). Except that it’s not the full story. It’s little known that Corbyn actually voted for an amendment to the resolution in support of Britain’s war on Iraq which objected to war merely for lack of UN authorisation, and pledged ‘total support for the British forces engaged in the Middle East, expresses its admiration for their courage, skill and devotion to duty, and hopes that their tasks will be swiftly concluded with minimal casualties on all sides’[ix]. So, Corbyn is admitting here where his true allegiance lies: to British imperialism, he wants them to win quickly, and his only qualm is that he doesn’t want Britain’s reputation tarnished by going against international law; otherwise they’re good to go. He is at ease with imperialism as long as it done under the cloak of bourgeois legality, and only opposes its more conspicuous aspects. In other words, he wants to have his cake and eat it: Is it possible to support Palestinians and those occupying their land and oppressing them? Is it possible to support workers and those trying to work them to the bones? Is it possible to support oppressed countries and those seeking to conquer them? Jeremy obviously believes so. 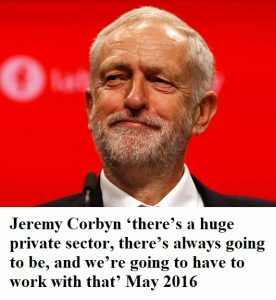 But you can’t have it both ways Jez. I’m sorry, I don’t make the rules. I also hear people saying, ‘well at least the word “socialism” is being discussed again’. But the danger is that the word becomes even more contaminated than it already is. Corbyn gets elected, the ‘socialist’ experiment fails, and socialism is banished from popular consciousness once again. If there were a law against misusing the word ‘socialism’ Corbyn would be arraigned. Of course, the whole ‘push Labour left’ strategy plays right into the hands of the party elite. That darling of the Labour left Richard Crossman (Labour MP 1945-74) was quite candid about this: the party could not afford to keep a huge staff on the payroll and so needed to motivate a militant army of volunteers to work on its behalf to win votes[x]. Thus, there is a carefully maintained balance in the party of zealous activists who do all the legwork at grassroots level and a party elite who cynically pay lip service to the former while doing the bidding of their capitalist overlords. As the reformist R.H. Tawney pointed out in a glorious self-own: ‘onions can be peeled leaf by leaf, but you cannot skin a live tiger claw by claw’. Revolution is the only solution. Corbynites will sometimes accept all this. They’ll accept that his party is incorrigible, that attempting to push Labour left is futile, even that Corbyn himself is a reactionary (which he is). Their last gasp attempt to defend support for the Labour party is to want to ‘get them in and expose them, give them the rope to hang themselves’. Ok. Except, we have a century’s experience of the Labour Party in parliament, we know exactly what they’re like. Corbyn is not a new phenomenon. ‘Leftwing’ Labour leaders have come and gone, arrived in a golden chariot only to crack the whip just like any other right-wing politician. Attlee was considered on the left of the party, then his government sicced the army on striking workers on 18 separate occasions when in power, while massacring colonised people all over the world in order for Britain to keep its grip on the Empire[xi]. Harold Wilson was considered a protégé of Nye Bevan, and went on to support the war on Vietnam[xii]. But we don’t even need to bring this up. Corbyn’s opposition record is already bad enough: he has written to local councillors to insist they impose Tory cuts, allowed a free vote on the bombing of Syria, now supports NATO, promises to reinforce Britain’s military, promises 10,000 extra cops on the street, reinforce borders, 1,000 extra spies to ‘combat terrorism’, and promises to make capitalism profitable for Britain’s ruling class. We must build a movement outside of and in opposition to the Labour Party, once and for all. [i] Laura Pidcock: working class hero?